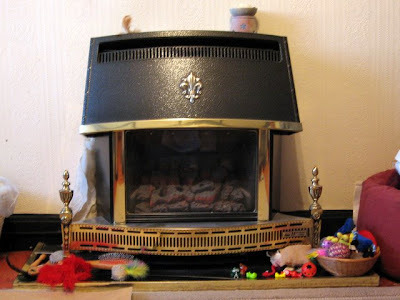 Yesterday, I took this picture of the 'fireplace' in my living room just before setting off for work, as we had workmen coming in to fit its replacement. The fitters arrived around 9:30am having rather optimistically saying they'd be gone by 1pm... I think perhaps they underestimated how much work was involved as they didn't escape until 5:30pm! Dave was in charge as I couldn't stay home all day and reports they worked steadily all day, but he was shocked at how much tea two men could drink and how much sugar we got through. The problems started when they removed the old fire and realised just how tiny the original fireplace was and that it wouldn't house the new fire. This meant they had to enlarge the chimney, which highlighted problem number two, namely the chimney breast had no lintel. A lintel (as I understand it) is a reinforced crossbar which is inserted into the chimney opening so that it doesn't collapse into the fireplace. Fortunately, the fitters had one in the van and work continued. After drilling out the bricks to fit the lintel and more drilling to enlarge the fireplace, they had to dismantle the living room so they could roll back the carpet. Which was when they discovered they'd need to cut through the floorboards to get to the gas pipe. Then, they had the fun of discovering the original hearth which needed a channel drilling in it before they could lay the new gas pipe for the fire. I'm imagining that by this time, they were sighing heavily. Ah well, they plodded on. Dave helped them where he could and mucked in with removing wallpaper (discovering probably the best bit of plaster in the house in the process), keeping them topped up with tea. They seemed happy enough. Doesn't it look all grown up? 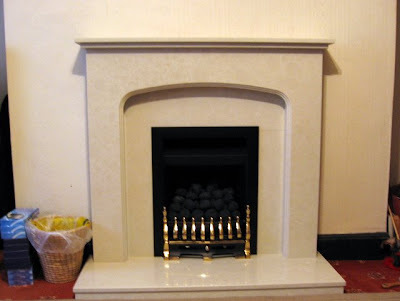 For those who might be interested, we bought the fire and new fireplace from The Heating Centre in Coventry, who have a large showroom of such things. They were helpful, reasonably priced and arranged the fitting. Even though there was far more work in the fitting than originally thought, the price for the fitting itself did not go up, although we did have to pay extra for the lintel. Hope it was fixed price? Richard - the price for installation was fixed and didn't go up, but they did charge an extra £80 for the lintel, which we thought was fair. It looks lovely, great to hear that the price stayed fixed too, good place.